We’d love your help. 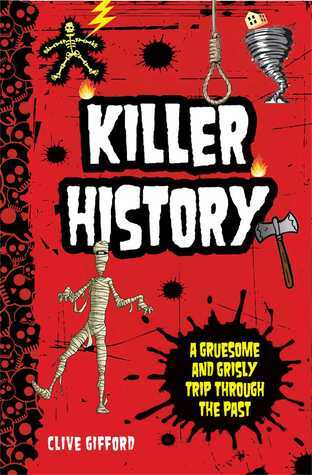 Let us know what’s wrong with this preview of Killer History by Clive Gifford. A gruesome and grisly trip through the past, Killer History explores the tradition, customs and fascinating stories that pertain to death, including burial customs, weapons, capital punishment and epidemics. Some kids are natural bookworms and others you have to chase down with a book. But every kid, even the ones that scowl when you say “read” will devour this mega mix of A gruesome and grisly trip through the past, Killer History explores the tradition, customs and fascinating stories that pertain to death, including burial customs, weapons, capital punishment and epidemics. To ask other readers questions about Killer History, please sign up. Is this the same as Dreadfully Deadly History: A Mega Mix of Death, Disease and Destruction? I rate it 5 stars because it was funny but gruesome like when a guy slipped and died on a orange peel. This review has been hidden because it contains spoilers. To view it, click here. I found the book to be a funny yet full of tragity. In the story around the first few pages i thought that is just gonna talk about horror stories. But later on there were kids that were living in this horror story. I thouht that the fact they just swithched the story sround was very tricky. if you have a strong stomach and you like books about death a long time ago this for you. It was a good book. I liked it because it was an easy read and fast. Quick, interesting YA about historical deaths. Fun for adults too, I enjoyed it. this book tell about deaths in times long ago on how people didn't know what was good for them and what were good cures so they died or how the "stupid" 1800's as the book calls them because they had the stupidest ways to kill or torture a person, but then the book was funny because it has riddles and jokes and things like "how to make yourself into a mummy". it's a really interesting book and a book that is my personal favorite, realistic fiction. Yeah, it's a book for juveniles but since the juvenile I bought if for isn't going to read it, I did. It was a quick, fun read, and full of numerous macabre tidbits that I will undoubtedly forget within the next few days. Read 50 pages a quit- was trying to get a feel for it to see if it would be a good addition to school library. A lot of interesting tid-bits. I could have done without the bread recipe and the how-to-make a volcano. Clive is an unusual author who likes to work in both fiction and non-fiction. Perhaps this reflects his unusual life which, so far, has seen him travel to over 70 countries, be held hostage in Colombia, go parachuting, coach several sports Clive Gifford is a highly experienced journalist and author with over 170 books published and more than 800 features and stories written for adults and children. Clive is an unusual author who likes to work in both fiction and non-fiction. Perhaps this reflects his unusual life which, so far, has seen him travel to over 70 countries, be held hostage in Colombia, go parachuting, coach several sports and run a computer games company.